William “Bill” C. Lonquist, Jr. ’48 served as a Yell Leader in the late 1940s. He is the current oldest living Yell Leader. William “Bill” C. Lonquist, Jr. ’48 knows the art of motivation. 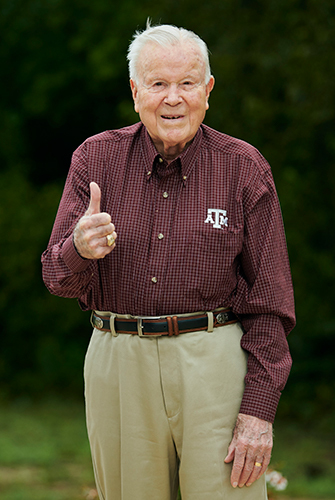 As a Yell Leader in the late 1940s, he honed his ability to create enthusiasm and inspire passion from his Texas A&M University classmates at athletic events. Those skills have served him well. After graduation, Lonquist steadily climbed to top leadership roles in the oil industry. 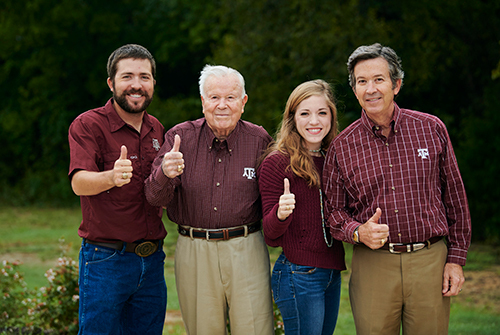 His loyalty to Texas A&M influenced his family, which now boasts three generations of Aggies. And his dedication to his alma mater led to a lifetime of service, including creating four scholarships through the Texas A&M Foundation. Lonquist grew up in an oilfield camp in Cayuga. As a youngster, he befriended one of his father’s professional colleagues, an engineer, who sparked his interest in petroleum engineering. That friendship started the teenager on his path to Texas A&M. The East Texan was among the first generation in his family to attend college and holds the honor of being the family’s first Aggie. At the time, Aggieland was a different place. The railroad tracks marked the edge of campus, and all students were members of the Corps of Cadets. The freshman class totaled 1,500 and students didn’t eat meals off campus. Hitchhiking was the norm; at the end of each semester, hundreds of students lined up along the highway to catch rides home. At the end of his freshman year in 1944, Lonquist’s studies were interrupted when he was drafted into the U.S. Navy. He was trained in radio communications and posted in Hawaii toward the end of World War II. After the war ended, he was reassigned for six months to the U.S. Port Director on the Island of Saipan. Upon his discharge from the service, Lonquist returned to Texas A&M to complete his degree. He found he had a deeper appreciation for the Corps’ commitment to discipline and cohesiveness, which differed from his experience in the Navy. “It was impressive to see individuals—who ranged from farm kids to big city boys—come into the Corps defining themselves as independent and then see them build a strong sense of camaraderie,” he said. Lonquist also immersed himself in other campus activities. He earned the nickname “Bullet” when he outran All-Southwest Conference football player “Country” Higgins during an intramural tag football game. Lonquist also remembers joining his classmates at the College Station train depot, where they vied for dates with the arriving female students who attended Texas State College for Women, Texas A&M’s sister college. 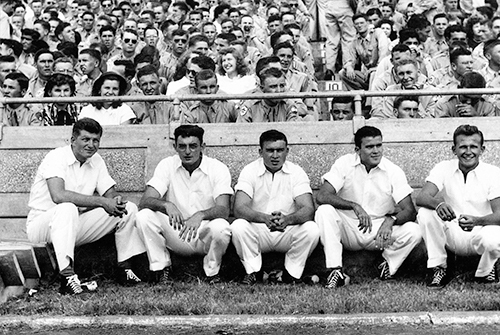 Bill Lonquist '48 (second from right) served as a Yell Leader with (left to right) Jim Stephens ’49, Dr. James H. “Red” Duke ’50, Tommy Splittgerber ’49 and Glenn Kothmann ’50. The year 1948 proved to be an exciting time for Lonquist, who was among the first group of World War II servicemen to be elected Yell Leaders. One of his fellow Yell Leaders was famed medical trauma surgeon Dr. James H. “Red” Duke ’50. Lonquist also served with Jim Stephens ’49, Tommy Splittgerber ’49 and Glenn Kothmann ’50. That year, the Aggie football team, which played in the 25,000-seat Kyle Field, lost every game except for one (which ended in a tie). As the dismal season progressed, the Yell Leaders started a new tradition in which Aggies kissed their dates when the offense made a first-down. In spite of the losing season, Lonquist has a wealth of positive memories: leading Yell Practice in front of the campus YMCA building, on the steps of the Texas State Capitol and in front of Houston’s Rice Hotel; being thrown into the Fish Pond; and giving a pep talk to the Aggie players prior to their game with Southwest Conference rival, Texas Christian University. After graduation, Lonquist began his long, successful career in the oil industry. Initially, he worked as a petroleum engineer with Seaboard Oil Company before joining Texas Eastern, where he eventually served as president of worldwide exploration and production. During this time, Lonquist earned a law degree from South Texas College of Law. In 1983, he formed Memorial Exploration Company, which focused on U.S. oil production, and served as its president until the company was sold in 1997. Bill Lonquist's loyalty to Texas A&M influenced his family, which now boasts three generations of Aggies. Shown from left to right is Kyle Lonquist '13, Bill Lonquist '48, Katie Lonquist Thomas '17 and Paul Lonquist '77. Not surprisingly, Texas A&M continues to be a central presence in the Lonquist family’s life. Two sons boast the middle names “Kyle” and “Ross.” Four of the five sons graduated from Texas A&M. In turn, five of 13 grandchildren are now Aggies. Lonquist also hopes that many of his eight great-grandchildren will eventually wear an Aggie ring. Additionally, his children and grandchildren are being recognized in their own right within the Texas A&M community. For instance, son Richard Lonquist ’87 co-owns Lonquist Field Services, which topped Mays Business School’s 2017 Aggie 100 list. Grandson Kyle Lonquist ’13 was a Yell Leader at Texas A&M University-Galveston, served on the President’s Student Advisory Committee and chaired the campus’s Big Event. Granddaughter Katie Lonquist Thomas ’17 was an Impact counselor and co-chair, a leader in Freshmen Leaders in Christ and a volunteer with Breakaway Ministries. Lonquist continues to find ways to show his devotion to Texas A&M. He regularly calls many members of his Corps unit and remains an avid supporter of Aggie athletics, having purchased season tickets for more than 50 years. He is also active in The Association of Former Yell Leaders and served as its president. He’s been a visible presence at many of the group’s functions and hosted dinners for Yell Leaders and their dates. The oilman continues to be financially generous as well. He contributed extensively to the Foundation through creating four scholarships. The first gift established a President’s Endowed Scholarship in 1992. Sixteen years later, he funded a General Rudder Corps Scholarship, an endowed scholarship in Mays Business School and an endowed scholarship in the College of Engineering’s Harold Vance Department of Petroleum Engineering. Additionally, he donates to the scholarship fund that helps Yell Leaders finish their education, supports Aggie athletics through the 12th Man Foundation and has assisted with numerous building campaigns, including the Kyle Field renovation and construction of the Hildebrand Equestrian Complex. The former executive also offers his expertise to the university. 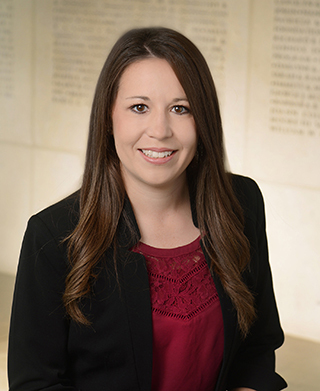 For example, Lonquist served as vice president of The Association of Former Students and as a member of Texas A&M’s President’s Advisory Council under former President Robert Gates. He is also a long-time member of the 12th Man Foundation and has been a visible presence at a variety of events across campus. To support the Texas A&M Yell Leaders with an endowed gift, contact Megan Pulliam ’09 by email at mpulliam@txamfoundation.com, or by phone at (800) 392-3310 or (979) 862-1247. Give online at give.am/YellLeaders.